People seeking spiritual guidance use a ouija board to contact spirits who they believe can answer their questions. Fortean Picture Library. The ouija board, introduced to the public in the late nineteenth century, is a popular instrument of spirit communication. This toy harks back to a similar instrument used in ancient Greece by the followers of the philosopher Pythagoras. In the years after the American Civil War, Spiritualism fostered a public interest in contacting what were believed to be spirits of the deceased. Given the relatively small number of mediums, various other means were tried to allow anyone to make contact, including several different simple devices. Then in the mid 1880s, a new idea circulated in the Spiritualist community. They created a board about 20 inches square upon which the letters of the alphabet, the ten numbers (0–9), and the words “yes” and “no” were displayed. On this board, one places a small device with three legs and a hole in the middle through which one canread a character, number, or yes/no response. To use the ouija board, two people sit facing each other and place their fingertips lightly on the small reading device. They allow it to move about the larger board, spelling out messages in answer to their questions. The most interesting aspect of this apparatus is the frequency with which it seems to work. In 1890, Elijah J. Bond filed a patent for a form of the new message board. The next year, with partners Charles W. Kennard and William H. A. Maupin, he began marketing his board as a novelty game. They called it a ouija (pronounced wee’-ja) board, claiming that the word was Egyptian for good luck. Since ouija is not an Egyptian word, others have suggested various origins of the name. After a decade of manufacturing the ouija board, in 1900 the Ouija Novelty Company hired William Fuld (d. 1927) as its president. Fuld set about reinventing the ouija board, and with a capable marketing effort he sold hundreds of thousands of them. He publicly claimed to have invented the board, naming it for the French (oui) and German (ja) words for yes. The company continued to manufacture the ouija board until 1966, when rights were sold to Parker Brothers, which continues to market it today. Through the years, a variety of competing message boards have been manufactured and sold, but none have attained the popularity of the ouija board. Though marketed as a novelty toy, those who use it often see it as a more serious device, and so a variety of books exist about messages received by people using the ouija board. In many cases,people who initiated spirit contact through the ouija board moved on to more efficient forms of communication, usually direct voice mediumship. Among the more important Spiritualist volumes related to ouija board use is the literature of Patience Worth, who wrote a set of books channeled through St. Louis housewife Pearl Curran. Due to interest in other forms of mediumship, little research has been done on the ouija board and how it operates. Many skeptics have assumed that it operates through the subconscious activity of the people who have their hands on the board. Some have attributed its apparent operation to the “ideomotor effect.” The mind, without reference to the consciousness, can stimulate subtle muscular movements that cause the reading device to move and spell out intelligible messages. As with many mediumistic communications, these results can appear startling. 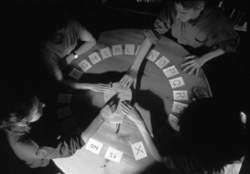 Since they originate from the ouija board users, the predictions can have more relevance than the readings from a professional medium. Observers have noted that in most cases, if the users are blindfolded, the messages spelled out on the board tend to become gibberish. Covina, Gina. The Ouija Book. New York: Simon & Schuster, 1979. Litvag, Irving. Singer in the Shadows: The Strange Story of Patience Worth. New York: Macmillan Company, 1972. St. Christopher, Michael. How to Use a Ouija Board. Los Angeles: International Imports, 1995. As someone with many years' experience in matters of a psychic/spiritual nature, I would have to urge parents to think twice about purchasing ouija boards for their children. In foal to Dubawi and due to deliver next month, Ouija Board has been represented by two runners - Listed-placed Voodoo Prince (by Kingmambo) and the winning Monsun gelding Aegaeus, both trained by Dunlop for Ouija Board's owner-breeder Lord Derby. Ouija board is a flat tablet featuring letters, numbers and other symbols, which ghostly spirits can supposedly control by directing a pointer to spell out words. It opens a gateway to another dimension, and when people who are not experienced spiritualists, play with Ouija boards mischievous entities can get through. Ouija Board, dubbed "a mare in a million", will feature prominently in Knowsley Hall's annual public open week, starting on Thursday. If Ouija Board were to produce a colt then we would probably sell as we usually do. Ouija Board was fifth to Alkaased last November before going on to win the Hong Kong Vase. Missing out on the Arc, Prix de l'Opera and Champion Stakes is looked upon as a blessing by trainer Ed Dunlop who now has Ouija Board as fresh as paint for her big assignment. It was Dettori's 131st success of the campaign, which has included a Classic victory on Sixties Icon in the St Leger and Group One wins on Ouija Board, Dutch Art and Authorize. OUIJA BOARD had to call on all her battling qualities to edge out Alexander Goldrun in an "awesome" renewal of the Vodafone Nassau Stakes at Glorious Goodwood. Ouija Board rescued the day for the bookmakers with her devastating performance in the main contest, with Electrocutionist (9-4) and 11-8 David Junior both being turned over. Aleister Crowley and the Ouija Board presents the fascinating true history of the ouija board, a device purported to facilitate communication with spirits, back to John Dee, Queen Elizabeth's advisor, who allegedly used it to contact angels and codify the Enochian Alphabet.